When Theodore Roosevelt pejoratively defined reform journalism as “muckraking” in a speech given April 14, 1906, he christened a movement begun three years earlier. Though Roosevelt denounced all expose literature at this time, historians since have used “muckraking” as a largely non-pejorative term for the era of reform journalism inaugurated by McClure’s Magazine in January, 1903. (2) Muckraking was a journalistic expression of the progressive mentality. Using the medium of the mass-circulation magazine, investigative reporters successfully exposed the rapid industrial growth and consolidation popularly believed to be undermining the social, political, and economic security of the American middle class. While many newspapers had disclosed local wrongdoings for some time, the wide readership of the monthly periodicals brought many hometown scandals to the attention of a national audience. When Richard Hofstadter wrote that it was “hardly an exaggeration to say…the progressive mind was characteristically a journalistic mind,” he was well aware of the tremendous influence the muckrakers had on the collective American mentality. (3) The progressive middle class, bent upon reforming the evils of industry and its political counterpart, machine government, needed a medium through which it could voice its concerns. Before corruption could be squelched, it had to be thrust into the harsh light of public scrutiny. The muckrakers ably performed this function. As plans solidified and writers were hired, the economic climate turned bleak: for McClure and Phillips, the Golden Age of Magazines seemed to be rapidly tarnishing. The first issues of McClure’s emerged during the panic of 1893, and it appeared the depression would squelch the fledgling magazine. Though the initial “number” was relatively inexpensive, at fifteen cents per copy — a year’s subscription for one and a half dollars — it was a dismal failure. (14) Of the 20,000 copies first printed, 12,000 were returned unsold from the newsstands, and McClure’s first sixteen months were marred by monthly losses of $5,000. (15) With characteristic persistence, McClure marshaled the necessary capital to push the magazine out of the red and into the black. This energy needed to be shaped, refined, edited. And John S. Phillips provided the restraint necessary to bring his associate’s ideas to fruition in the form of concrete magazine copy. Phillips was the “editor’s editor.” He sorted through the myriad of story ideas which McClure churned out, and picked the ones that looked promising. McClure’s writers often recalled this fact: William Allen White, in his autobiography, commented with tongue-in-cheek that “Sam had three hundred ideas a minute, but J.S.P. [Phillips] was the only man around the shop who knew which one was not crazy.” (25) Lincoln Steffens, in an interview with historian Ada McCormick, recalled how “McClure would have ten ideas, one good….” (26) The exact number of impractical inspirations is unimportant; it is sufficient to note the majority of McClure’s schemes were, at best, castles in the air. Tarbell and Phillips also enjoyed the loyalties of many of the McClure’s staff, who often served in both editorial and authorial capacities for the magazine. Lincoln Steffens, Ray Stannard Baker, and William Allen White provided many of the stories which soon fueled McClure’s popularity, while Albert Boyden organized the piles of copy in his capacity as desk editor. John Siddall, placed on the payroll at Tarbell’s request, acted as research assistant. All served under Phillips and Tarbell who, as minority stockholders in the S.S. McClure Company, acted as intermediaries between the staff and their editor-in-chief. (29) Thus, the correspondence of Phillips and Tarbell accurately reflects the feelings of their subordinates, who looked to them for leadership. As McClure traveled the world in search of ideas and inspiration, Tarbell and Phillips unofficially ran the magazine in New York. Together, they offered the staff a sense of stability McClure could not provide. Though McClure was officially the figurehead of his burgeoning periodical, he never won the unshakable staff loyalty Phillips and Tarbell enjoyed. This proved crucial when McClure’s later faced crisis. As McClure’s popularity continued to escalate at the turn of the century, the staff faced the hectic struggle to generate suitable ideas for magazine articles. McClure recognized the growth of trusts as a subject worthy of study. A man with an instinct for the tastes of the reading public, McClure discerned “the coincidence of market andmission;” (30) a story about burgeoning industrial consolidation would perform a public service by lessening widespread ignorance about how trusts operated — even better, it would sell magazines. (31) Thus, he set out to convince the McClure’s staff that trusts were “the only side of present day interests that [they] did not seem to be grappling with properly in the magazine.” (32) When McClure told his writers to dig for suitable stories, staff reporter Ray Stannard Baker provided the crucial spark which ignited the muckraking movement at McClure’s. 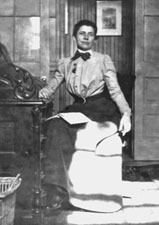 For Ida Tarbell and her colleagues on the staff of McClure’s, morality was a measure of right and wrong action gauged to their middle-class, progressive beliefs. In the words of historian David Mark Chalmers, “‘Public morality’ [was] their morality, and the ‘public interest’…their interest.” (43) Trusts were morally offensive to progressives because it was believed they were business consolidations acquired through unfair privilege; they were perceived as harmful to the economic power of the middle class, and were therefore considered a menace to all society. As “Tweed Days in St. Louis” went to press in October, 1902, McClure sent Steffens to investigate municipal corruption in Minneapolis. by November this article was in rough draft form and undergoing revision for publication as “The Shame of Minneapolis.” Another series was successfully launched. S.S. McClure was elated. In his possession, for publication in the January, 1903, McClure’s, were three articles with a common theme: lawlessness. All met McClure’s strict standards for thorough, well-dominated research, and all contained facts explosive in their implications. The third installment of Tarbell’s Standard Oil series was ready for publication. So, too, were Steffens’ “The Shame of Minneapolis” and Baker’s “The Right to Work.” These articles were, in short, indictments against businessmen, politicians, and organized labor. How many of those who have read through this number of the magazines noticed it contains three articles on one subject? We did not plan it so; it is a coincidence that the January McClure’s is such an arraignment of American character as should make every one of us stop and think. How many noticed that? The leading article, ‘The Shame of Minneapolis,’ might have been called ‘The American contempt of Law.’ That title could well have served for the current chapter of Miss Tarbell’s History of Standard Oil. And it would have fitted perfectly Mr. Baker’s The Right to Work.’ All together, these articles came pretty near showing how universal is this dangerous trait of ours. Miss Tarbell has our capitalists conspiring among themselves, deliberately, shrewdly, upon legal advice, to break the law so far as it restrained them, and to misuse it to restrain others who were in their way. Mr. Baker shows labor, the ancient enemy of capital, and the chief complaint of the trusts’ unlawful acts, itself committing and excusing crimes. And in ‘The Shame of Minneapolis’ we see the administration of a city employing criminals to commit crimes for the profit of elected officials, while the citizens…stood by complacent and not alarmed. The McClure’s staff spawned a journalistic movement which articulated progressive ideals and presented them on a nationwide scale. In one well-researched, well-written, and well-timed issue, the January 1903 McClure’s succeeded in capturing the spirit of the era. Basking in the glow of public adulation, the staff never anticipated S.S. McClure’s actions would soon cause a storm of indignation fierce enough to wrench the magazine apart. 1 Ida M. Tarbell, All in the Day’s Work. (New York: The Macmillan Company, 1939), p. 257. Hereafter cited as Tarbell, Day’s Work. 2 Harold S. Wilson, McClure’s Magazine and the Muckrakers. (Princeton University Press, 1970), p. 146. Hereafter cited as Wilson, McClure’s Magazine. 3 Hofstadter, Age of Reform, pp. 186-187. 4 Hofstadter, Age of Reform, p. 202. 5 Hofstadter, Age of Reform, p. 187. 6 Horton, Lincoln Steffens, p. 40. 7 David Mark Chalmers, The Muckrake Years. (New York: D. Van Nostrand Company, 1974), p. 10. Hereafter cited as Chalmers, Muckrake Years. 8 Peter Lyon, Success Story; The Life and Times of S.S. McClure. (New York: Scribners, 1963), pp. 113-114. Hereafter cited as Lyon, Success Story. 9 Mott, American Magazines, p. 589. 10 Mott, American Magazines, p. 589. 11 Lyon, Success Story, p. 116. 12 Lyon, Success Story, p. 116. 13 Cited in Lyon, Success Story, p. 121. 14 Mott, American Magazines, p. 589. 15 Theodore P. Greene, America’s Heroes; The Changing Models of Success in American Magazines. (New York: Oxford University Press, 1970), p. 84. Hereafter cited as Greene, America’s Heroes. 16 Horton, Lincoln Steffens, p. 51. 17 McClure’s promotional pamphlet, IMT Collection, McClure, S.S. (Business) file, Allegheny College Library, Meadville, Pennsylvania. 18 Greene, America’s Heroes, pp. 89-90. 19 Lyon, Success Story, p. 159. 20 Greene, America’s Heroes, p. 84. 21 Cited in Tarbell, Day’s Work, p. 200. 22 Lyon, Success Story, p. 276. In this thesis, the term “staff” designates the McClure’s editorial staff, which was responsible for controlling the content of the magazine. 23 Joseph Lincoln Steffens, The Autobiography of Lincoln Steffens. (New York: Harcourt, 1931), pp. 361-362. 24 Cited in Mott, American Magazines, p. 594. 25 Horton, Lincoln Steffens, p. 52. 26 White, Autobiography, pp. 386-387. 27 Interview notes of Ada McCormick, undated, IMT Collection, Lincoln Steffens Talking About Ida Tarbell file, Allegheny College Library, Meadville, Pennsylvania. Hereafter cited as Interview notes, Lincoln Steffens Talking About Ida Tarbell file. 28 IMT Diary, entry dated March 22, 1906, IMT Collection, IMT Diary file, Allegheny College Library, Meadville, Pennsylvania. Hereafter cited as IMT Diary, March 22, 1906. 29 S.S. McClure to Ida Tarbell, undated, IMT Collection, McClure, S.S. (Personal) file, Allegheny College Library, Meadville, Pennsylvania. 30 The stock ownership of McClure, Phillips, and Tarbell is discussed on pages 49 and 56 of this thesis. 31 Mary E. Tomkins, Ida M. Tarbell. (New York: Twayne Publishers, Inc., 1974), p. 57. Hereafter cited as Tomkins, Tarbell. 32 Samuel Sidney McClure, My Autobiography. (New York: Frederick A. Stokes Company, 1914), p. 238. 33 Cited in Lyon, Success Story, p. 192. 34 Cited in Lyon, Success Story, p. 191. 35 Lyon, Success Story, p. 193. 36 Tarbell, Day’s Work, p. 202. 37 Tarbell, Day’s Work, p. 202. 38 Tarbell, Day’s Work, p. 203. 39 Esther Tarbell to Ida Tarbell, August 6, 1893, IMT Collection, Tarbell, Esther McCullough file, Allegheny College Library, Meadville, Pennsylvania. 41 Wilson, McClure’s Magazine, p. 139. 42 Tomkins, Tarbell, p. 60. 43 Tomkins, Tarbell, p. 60. 44 Chalmers, Muckrake Years, p. 69. 45 Wilson, McClure’s Magazine, p. 142. 46 Wilson, McClure’s Magazine, p. 142. 47 Lyon, Success Story, p. 207. 48 Joseph Lincoln Steffens, The Shame of the Cities. (New York: Sagamore Press, 1957), p. vi. Hereafter cited as Steffens, Shame of Cities. 49 Steffens, Shame of Cities, p. 23. 50 Steffens, Shame of Cities, p. 4. 51 Patrick F. Palermo, Lincoln Steffens. (Boston: Twayne Publishers, 1978), p. 62. Hereafter cited as Palermo, Steffens. 52 Lyon, Success Story, p. 215. 53 Steffens, Shame of Cities, p. 4. 54 Cited in Wilson, McClure’s Magazine, p. 145. 55 John E. Semonche, Ray Stannard Baker; A Quest for Democracy in Modern America, 1870-1918. (Chapel Hill: University of North Carolina Press, 1969), p. 105. Hereafter cited as Semonche, Ray Stannard Baker. 56 Lyon, Success Story, p. 203. 57 Semonche, Ray Stannard Baker, p. 105. 58 Semonche, Ray Stannard Baker, pp. 106-107. 59 Lyon, Success Story, p. 216. 60 Semonche, Ray Stannard Baker, p. 109. 61 Semonche, Ray Stannard Baker, p. 109. 62 S.S. McClure, “Concerning Three Articles in this Number of McClure’s, and a Coincidence that May Set Us Thinking,” McClure’s, January, 1903, p. 336. 64 Horton, Lincoln Steffens, p. 54. 65 Tarbell to C.C. Regier, May 25, 1922. 66 Wilson, McClure’s Magazine, p. 319. 67 Tomkins, Tarbell, p. 18. 68 Palermo, Steffens, pp. 57-58. 69 Tomkins, Tarbell, p. 18. 70 Justin Kaplan, Lincoln Steffens. (New York: Simon and Schuster, 1974), p. 118. 71 Semonche, Ray Stannard Baker, p. 7. 72 Palermo, Steffens, p. 15. 73 Wilson, McClure’s Magazine, pp. 149, 256. 74 Tomkins, Tarbell, p. 15. 75 Hofstadter, Age of Reform, p. 170. 76 Lyon, Success Story, p. 208. 77 Cited in Wilson, McClure’s Magazine, p. 179. 78 Walter Johnson, William Allen White’s America. (New York: Henry Holt, 1947), pp. 137-138. 79 Lyon, Success Story, p. 206. 80 E.J. Ridgway to Oscar Brady, June 8, 1904, IMT Collection, McClure, S.S. (Business) file, Allegheny College Library, Meadville, Pennsylvania. 81 Chalmers, Muckrake Years, p. 70.